Psychosocial stress, both at work and at home, plays a role in sleep disturbances. Theoretical models of stress underscore the cumulative effect of stress from different domains in affecting health and well-being. However, previous research has not considered how work stress and stress in private life might interact to affect sleep. The study investigated potential synergistic effects of work stress and traumatic events in private life on sleep quality. Participants (N = 6552, average baseline age = 52) were a subset of the French GAZEL cohort who were working in 1999. Work stress was operationalized as high job demands and low decision latitude. These working conditions were self-reported in 1999 (study baseline). Traumatic events in the past 12 months were reported in 2000. Sleep quality was assessed in 2000 as disturbed sleep in the past 12 months, and current sleep problems was indexed by the sleep subscale of the Nottingham Health Profile questionnaire. The results showed that recent events interacted with decision latitude, but not job demands, in predicting sleep quality. However, contrary to our expectations, it was high and not low decision latitude at work that amplified the negative association between stressful events and sleep quality. Adjusted for baseline health, individuals with highest numbers of events and highest levels of decision latitude were at highest risk for impaired sleep. These results challenge the idea that high decision latitude always serves as a protective factor, and underscore the necessity for considering a broader life context when studying stress in a particular domain of life. Psychological stress plays an important role in sleep disturbances (Espie, 2002). A large body of previous work on stress and sleep has focused on work stress (De Lange et al., 2009; Halonen et al., 2016). Several studies have also shown that stress in private life, in particular major life events, affects sleep (Bernert, Merrill, Braithwaite, Van Orden, and Joiner, 2007; Hall et al., 2015). However, one important limitation of this previous work is that the effects of stress from different domains are considered in isolation. Theoretical models of stress and health have argued that an accumulation of stress from different life domains may be a better predictor of health outcome than the exposure to individual stressors (Thoits, 2010). Accordingly, the present study considers how psychosocial work characteristics interact with private life circumstances in affecting sleep quality. Psychological stress is commonly defined as an increase in demands from the environment combined with a perceived shortage of resources to meet those demands (Lazarus, 1999). Psychological stress triggers a physiological stress response, characterized by increased activation in the central nervous system and the hypothalamic-pituitary-adrenal axis, which in turn leads to changes in other interconnected physiological systems, e.g. increased heart rate and blood pressure, increased blood sugar levels, etc. (McEwen, 1998). The physiological arousal associated with stress is thought to interfere with the ‘winding down’ needed to fall and stay asleep. Indeed, insomnia patients have been found to have elevated heart rate and hyperactivation of the central nervous system (Bonnet and Arand, 2010). Thus, psychological stress is theorized to play an important role in sleep disturbances (Akerstedt, 2006; Espie, 2002). The link between stress and sleep has been confirmed both in laboratory settings and in observational studies. For instance, Kim and Dimsdale (2007) review studies showing that acute psychological stress induced in the laboratory (e.g. a challenging test) had an adverse effect on sleep the following night, e.g. made it more difficult to fall asleep and increased the number of awakenings. A large body of observational studies has focused on work stress and sleep (reviewed in the next section). Several studies have also addressed stress in private life, showing, for example, that major stressful life events, such as bereavement or divorce, negatively affect sleep as assessed by objective measures (Kim and Dimsdale, 2007). Other observational studies have also found that stressful life events prospectively predicted self-reported insomnia (Bernert, Merrill, Braithwaite, Van Orden, and Joiner, 2007; Hall et al., 2015). However, compared to work stress, stress in private life, particularly that going beyond major life events, has been less well studies in relation to sleep. Many observational studies of stress and sleep use measures of work stress. This research has been largely guided by Karasek’s (Karasek and Theorell, 1990) job demand-control (JDC) model, one of the most influential models of psychological stress at work. Reflecting the definition of psychological stress cited above, the model is based on two components: job demands (e.g. heavy work load, time pressure) and decision latitude (control over work activities). According to this model, high job demands, especially in combination with low decision latitude, create stress and thus negatively affect psychological well-being. Decision latitude, on the other hand, is postulated to reduce a worker’s stress by providing more resources to cope, and thus is deemed to be health-protective. Previous research on work stress has linked reduced sleep quality to high psychological job demands and low decision latitude. For example, a prospective study by De Lange et al. (2009) found that high job demands and low job control predicted an increase in sleep-related problems across time and that both prolonged exposure to job strain and transitioning from non-high-strain to a high-strain job were associated with increased sleep complains over time. Similarly, in a recent non-randomized pseudo-trial, Halonen et al. (2016) found that the onset of job strain predicted the onset of subsequent insomnia symptoms. A systematic review of the literature on psychosocial working conditions and sleep (Linton et al., 2015) also concludes that job strain and high work demands are among factors associated with future sleep disturbances, while high job control is related to fewer sleep problems. In another systematic review (Van Laethem, Beckers, Kompier, Dijksterhuis, and Geurts, 2013), the authors conclude that there is currently evidence to claim a link between high job demands and low decision latitude on one hand and poor sleep quality on the other hand. They note, however, that the quality of the existing literature is not high enough to examine the causality of this relationship. While being one of the most influential theoretical models guiding research on works stress and health, the JDC model has also been criticized for its simplicity. In their theoretical paper, Bakker and Demerouti (2007) argue that the model relies on a very limited set of predictors that may not be equally relevant for all types of jobs and it does not take into full account the complexity of working organizations. A related criticism, which has until recently not been discussed much in the literature, is that the JDC model does not take into full account the complexity of the real life context in which the working conditions are incorporated. At the same time, models of stress have argued that an accumulation of stress from different life domains may be a better predictor of health outcomes than the exposure to individual stressors (Thoits, 2010). Furthermore, a growing body of evidence suggests joint effects of work factors and factors outside the workplace on health. Melchior et al. (Melchior, Berkman, Niedhammer, Zins, and Goldberg, 2007) and Sabbath et al. (Sabbath, Melchior, Goldberg, Zins, and Berkman, 2012) found that people with the highest number of demands at work and at home had the highest rates of sickness absence, including absence due to psychiatric diseases. Similarly, an accumulation of various types of stressors, both at work and in private life, has been found to increase the risk of major depression (Wang and Schmitz, 2011). Madsen et al. (Madsen, Jorgensen, Borritz, Nielsen, and Rugulies, 2014) showed that job strain (a combination of high job demands and low decision latitude) increase the risk of severe depressive symptoms only in combination with low social support in private life. Dich et al. (Dich, Lange, Head, and Rod, 2015) demonstrated that individuals who experience job strain in combination with a high caregiving burden (long hours of caring for an aged or disabled relative) are at highest risk for physiological dysregulation. However, to the best of our knowledge, no previous studies have addressed interactions between work stress and stress outside workplace, in particular the stress resulting from traumatic events in private life, in relation to sleep quality. In this study, we consider how work stress and stress outside work place, more specifically traumatic life events related to family, might modify each other’s association with sleep quality. We hypothesized that recent traumatic events in private life and work stress, defined as high job demands and low decision latitude, might exacerbate each other’s negative effects of sleep quality. Many people experience symptoms of psychological distress, including poor sleep, following major traumatic life events (Hall et al., 2015; Kessler, 1997), although for most people these consequences are short-term (Bonanno, 2009; Reynolds and Turner, 2008). Therefore, in the present study, we focus on short-term effects of traumatic life events, i.e. effects reported within one year of the life events. The data were drawn from the French GAZEL cohort study, established in 1989. Its first wave surveyed 20,625 employees of the French national gas and electricity company. The sample includes workers from all regions of France, and there is a wide socioeconomic range of occupational positions, including white and blue-collar workers. The original sample of GAZEL participants are annually administered a questionnaire covering a range of psychosocial factors at work and in private life as well as comprehensive information on mental and physical health (Goldberg et al., 2007; Goldberg, Leclerc, and Zins, 2015). At study baseline (1999), 14,563 people still participated in GAZEL; of them 7,474 (51%) were still working at baseline and reported on current job conditions, and 6,722 (46%) also returned the 2000 questionnaire. We further excluded 170 participants with missing information on sleep and one or more of the covariates. The final sample included 6,552 participants (45% of those who returned the 1999 questionnaire), mean age was = 52 (SD = 3), 32% were women, 38% were high-level executives, 52% were mid-level managers and 10% were low-wage workers, which included both manual and non-manual workers. Participants who returned a baseline questionnaire but were excluded from the present study were older, more likely to be men, and had lower socio-economic position than those included in the study. All participants had given informed consent. The GAZEL study was approved by the French national ethics committee (Commission nationale de l’informatique et des libertés [CNIL]). Job demands and decision latitude were self-reported at baseline (1999). Traumatic life events that happened between 1999 and 2000 were reported at the one-year follow-up in 2000. Sleep quality was reported at the one-year follow-up in 2000. The choice of 1999 as the baseline is explained by the fact that, even though the GAZEL questionnaire is administered annually, its content is not the same every year and the measures of working conditions and health needed for the current study were not available until 1999–2000. GAZEL participants were asked about a range of events that happened to themselves, their spouse or partner, or their close family member. The list of events covered positive, negative, and neutral changes (e.g. birth of a child, important purchase, or death). Due to the focus of the study on traumatic events in private life (further: life events), for our analyses we selected five negative events (not related to work) likely to have highest emotional impact: death of a spouse, death of a close relative, hospitalization of a spouse, hospitalization of a close relative (as a proxy for serious illness), and divorce. These events tend to be highly stressful for most people (Holmes and Rahe, 1967); whereas reactions to other events such as birth of a child and important purchase may vary greatly among individuals and therefore it is unclear to what extent they would constitute stress in private life. Number of life events was used as a measure of accumulation of stressors. Job demands and decision latitude were measured using Karasek’s Job Content Questionnaire (Karasek and Theorell, 1990), a validated and widely used instrument for the assessment of psychosocial working conditions. The job demands scale includes five items, reflecting the speed and intensity of work and time shortage, e.g. ‘My job requires working very fast’. The decision latitude scale consists of two subscales, decision authority (three items, e.g. ‘My job allows own decisions’) and skill discretion (six items, e.g. ‘My job requires creativity’). All items are scored on a scale from 1 – ‘completely disagree’ to 4 – ‘completely agree’. The final score on each scale is a weighted average of item scores (please see Karasek and Theorell, 1990 for the exact weighting formulae). The present study used two separate outcomes related to sleep quality. Concurrent (i.e. present at the time of filling out follow-up questionnaire) impaired sleep symptoms were measured using the sleep subscale of the Nottingham Health Profile (NHP) questionnaire (Hunt et al., 1980). This measure is further referred to as NHP sleep problems. The NHP is an instrument widely used for assessment of subjective well-being, with well-established reliability and validity (MacDowell and Newell, 1996). The sleep subscale contains five items, assessing difficulties falling asleep, wakefulness in the middle of the night, and overall poor sleep quality, e.g. ‘I lie awake for most of the night’, ‘I sleep badly at night’. Participants answered ‘yes’ or ‘no’ to each item. The score on each scale is a weighted sum of items to which a participant answered ‘yes’, with a possible range from 0 to 100 and higher scores on each subscale indicating poorer sleep (please see Hunt and McEwen, 1980 for more details on the weighting). The NHP sleep problem measure was treated as a continuous variable in the analysis. The second measure of sleep quality assessed disturbed sleep within the past 12 months. This question was a part of a list of health problems that the participants were asked to indicate. The sleep item was formulated as: ‘Are you currently suffering or have you in the past 12 months suffered: disturbed sleep’. Participants could answer ‘yes’ or ‘no’ to this item. Disturbed sleep in the past 12 months was treated as a binary variable in the analyses. While the former measure of sleep quality is superior in that it is based on multiple items and has been previously validated, it only addresses present symptoms. However, as discussed in the introduction, the effects of stressors such as traumatic life events may be only short-term and thus may have attenuated by the time the follow-up questionnaire was administered. The second measure, which covers sleep in the past 12 months, was therefore added to potentially capture the most immediate effects on sleep. The continuous NHP sleep problems measure was right-skewed. Therefore, instead of a linear regression, a generalized linear model with a negative-binomial distribution and a log link was employed, as appropriate for right-skewed over-dispersed distributions often seen for count-type responses. Such models are more flexible compared to linear regression in that the normality assumption is lifted. The effect size estimates are in this case interpreted as percentage increase in the reported symptoms (Tutz, 2011). The binary variable disturbed sleep in the past 12 months was analyzed using a logistic regression. For each of the two outcomes, a main effect model and two interaction models were employed. 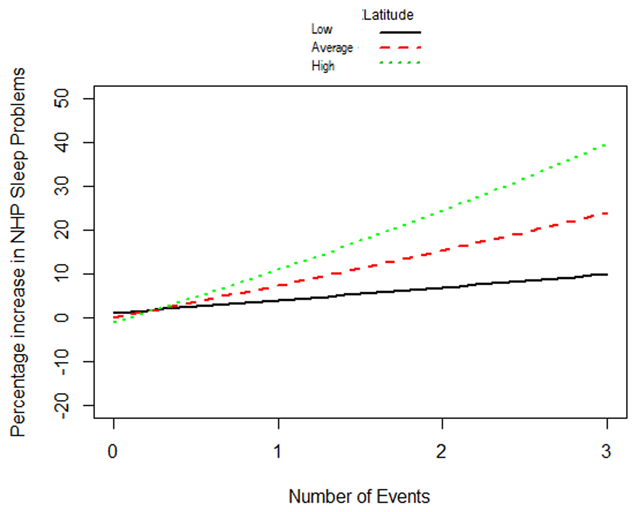 In the main effect model, number of events, job demands, and decision latitude were entered as predictors. 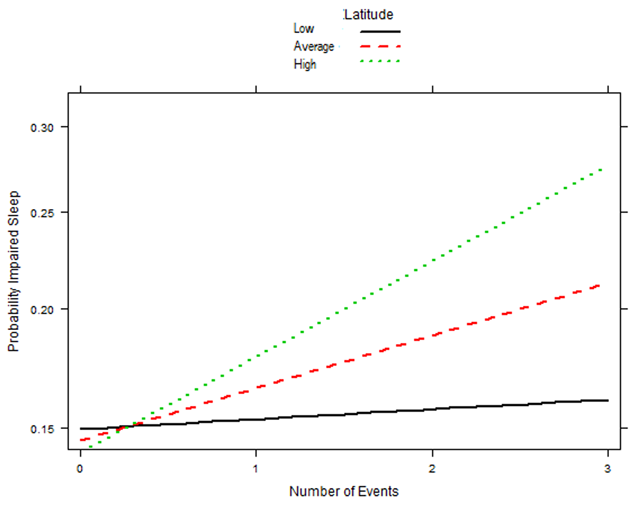 In the two interaction models, an interaction term was added, which was a product of the number of events and job demands/decision latitude, respectively. Potential confounders were identified based on existing knowledge about risk factors for the relation of interest (Greenland, Robins, and Pearl, 1999). All analyses were controlled for the demographic variables of age, gender, and socioeconomic position [low-wage (I), mid-level managers (II), executive (III)]. Furthermore, mental and physical health is likely to affect both perception of work stress and sleep quality and thus may create a spurious association between working conditions at baseline and sleep quality at follow-up. In order to account for potential confounding by baseline health, we also adjusted for baseline depressive symptoms (CES-D) (Radloff, 1977) and perceived general health (‘How would you describe your general health?’ rated on an eight-point scale from ‘good’ to ‘poor’). Two hundred fifty-nine participants were missing data on the NHP sleep problems. The job demands and decision latitude scores were approximately normally distributed. The job demands average was 2.59 (SD = 0.50) on a scale from 1 to 4, meaning that approximately the same number of workers agreed (or somewhat agreed) and disagreed (or somewhat disagreed) with the statements characterizing high job demands. The average decision latitude score was 2.97 (SD = 0.46) on a scale from 1 to 4, suggesting that there were more people who agreed (or somewhat agreed) with statements characterizing high decision latitude than those who disagreed (or somewhat disagreed). The majority of participants (71%) reported no traumatic events, and the maximum number of traumatic events in the past year was three (out of five considered in the study). Twenty-one percent of respondents reported disturbed sleep in the past 12 months. The distribution of NHP sleep problems was right-skewed, with 53% of participants reporting no symptoms. Table 1 presents effect sizes and confidence intervals for the main effects of the number of life events, job demands and decision latitude, adjusted for the demographic covariates and baseline health. There was an association between the number of life events and both measures of sleep quality (p = 0.028 for NHP sleep problems; p = 0.048 for disturbed sleep in the past 12 months). High baseline job demands were associated with higher scores in both sleep measures (p = 0.004 for NHP sleep problems; p = 0.007 for disturbed sleep in the past 12 months), but there was no association between decision latitude and either measure of sleep quality (Table 1). Men reported fewer sleep problems than women; age and socio-economic position had no statistically significant association with sleep quality; both depression and poor physical health at baseline were associated with poorer sleep quality at follow-up (estimates not shown). Odds ratios for disturbed sleep in the past 12 months and percent increase in NHP sleep problems at follow-up, associated with baseline job demands and decision latitude and traumatic life events between baseline and follow-upa. aAdjusted for age, gender, and socio-economic position, baseline CESD score, and baseline self-rated health. The interaction between job demands and the number of life events was not statistically significant for either of the sleep quality outcomes, suggesting that life events and job demands did not modify each other’s association with sleep. With respect to decision latitude, we expected that low decision latitude and life events might amplify each other’s negative effect on sleep and that individuals with lowest decision latitude and highest number of life events would have poorest quality of sleep. This prediction was not confirmed. In fact, a very different pattern of interaction emerged, as illustrated in Figures 1 and 2. The figures show that individuals with the highest numbers of events and highest levels of decision latitude were at highest risk for poor sleep. Moreover, the interaction between life events and decision latitude was statistically significant in predicting disturbed sleep in the past 12 months, indicating that high decision latitude and life events amplified each other’s association with disturbed sleep. Furthermore, the association between the number of life events in the past year and disturbed sleep in the past 12 months was strongest in individuals with high decision latitude (OR = 1.30; 95% CI: 1.11–1.51 for each additional event at the level of decision latitude one SD over the mean), whereas for individuals with low decision latitude, there was no association between life events and disturbed sleep in the past 12 months (OR = 0.97; 95% CI: 0.84–1.12 for each additional event at the level of decision latitude one SD below the mean). A similar pattern of results was observed for NHP sleep problems (Figure 2), where an association between the number of life events and sleep problems was only observed in individuals with high decision latitude (12% increase in symptoms for each additional event at the level of decision latitude on SD above the mean; 95% CI: 2.5–22.8), but not with low decision latitude (3% increase in symptoms for each additional event at the level of decision latitude on SD below the mean; 95% CI: –6.0–12.5). However the interaction between the number of life events and decision latitude was not statistically significant on this scale. Joint effect of baseline decision latitude and life events between baseline and follow-up on the probability of impaired sleep between baseline and follow-up. Adjusted for gender, age, socio-economic position, baseline depressive symptoms and self-reported health. Joint effect of baseline decision latitude and life events between baseline and follow-up on percent increase of impaired sleep symptoms at follow-up. Adjusted for gender, age, socio-economic position, baseline depressive symptoms and self-reported health. The present study contributes to research on stress and sleep by considering the interactions between psychosocial working conditions and factors outside the workplace. We hypothesized that recent traumatic life events and adverse psychosocial working conditions (high job demands and low decision latitude) would have a synergistic negative effect on sleep quality. These hypotheses were not supported in our study. Consistent with previous research on stress and sleep (Bernert et al., 2007; Hall et al., 2015), we found an unsurprising association between life events and impaired sleep. Furthermore, consistent with previous studies (Linton et al., 2015; Van Laethem et al., 2013), we found that high job demands at baseline were related to poor sleep quality at one-year follow-up. However, job demands and stressful events did not interact in predicting sleep. In other words, the presence of heavy work load, reflected by the job demands measure, did not seem to increase vulnerability to sleep problems resulting from life events or the other way around. Further, we did not find an association between decision latitude at baseline and sleep quality at follow-up when we adjusted for baseline depressive symptoms and self-reported health. Moreover, contrary to our hypothesis, we found that it was the combination traumatic life events and high rather than low decision latitude that was associated with poorest sleep quality. The latter findings contradict a large body of literature claiming protective effects of decision latitude on health and well-being (Häusser, Mojzisch, Niesel, and Schulz-Hardt, 2010). On the other hand, our findings are consistent with several recently published studies which demonstrate an association between high decision authority, an aspect of decision latitude, and adverse health outcomes. For instance, Joensuu et al. (2010) found an association between high decision authority and increased risk of depressive disorders. Active jobs, having a combination of high demands and high decision latitude, have been linked to higher perceived strain (Demerouti, Bakker, de Jonge, Janssen, and Schaufeli, 2001) and higher risk of cardiovascular disease in women (Eaker, 2004; Slopen et al., 2012). A recent large-scale Finnish study found that decision authority was associated with lower all-cause mortality in white-collar women, but with higher mortality in blue-collar women (Joensuu et al., 2014). Earlier studies also found an association between high decision authority and higher risk of death and hospitalization with mental disorders in employees from the forest industry (Joensuu et al., 2012). An exhaustive explanation of these latter findings is lacking in the literature. One potential reason why high decision latitude may exacerbate distress resulting from events is that making decisions about how to perform one’s work when other areas of life demand a lot of attention may be challenging. Under normal circumstances, decision latitude can make for an engaging and satisfying job and provide opportunities for learning and professional growth (Demerouti et al., 2001). Furthermore, high decision latitude is thought to provide workers with additional resources to cope with demands at work (Bakker and Demerouti, 2007). However, at times of life crises, autonomy and variety may not be the most important resources at work, and perhaps social support and high quality leadership may play a more important role in protecting individual’s well-being (Bakker and Demerouti, 2007). Furthermore, it is also possible that the effects of decision latitude are non-linear, so that both too little and too much decision latitude may exacerbate the effects of stress outside workplace. However, our sample had a relatively large proportion of high-level executives, i.e. persons whose job is characterized by high decision latitude, and there were few people who reported very low decision latitude. This may be why we do not see the effects of very low decision latitude. On the other hand, our results may be particularly relevant for the current circumstances as the number of automatized jobs decreases and the level of decision latitude increases. Several limitations of the study need to be mentioned. We excluded participants with missing questionnaire responses, which may raise concern about non-random loss to follow-up. This type of selection bias will most likely create bias towards the null and the associations reported herein may be underestimated. Some of the participants may have been on sickness leave due to the major life events, which would make working conditions less relevant for their sleep, resulting in underestimation of the association between working conditions and sleep quality in our study. One of the indicators of sleep quality was reported as present symptoms or symptoms experienced in the past 12 months, i.e. within the same time frame as life events, thus the temporal relation between the life events and impaired sleep reported as current or recent symptoms cannot be ascertained. On the other hand, our second indicator of impaired sleep was reported as concurrent symptoms at follow-up, i.e. after the events had already happened, and the pattern of results was similar. The causality of relationships between stress and self-reported well-being, including sleep quality, are notoriously difficult to establish (Kessler, 1997; Watson, Pennebaker, and Folger, 1987). This relationship is known to be confounded by negative affectivity, which is associated with a tendency to report more stress as well as more mental and physical health complaints (Watson and Pennebaker, 1989; Watson et al., 1987). In our study, we did not have a measure of negative affectivity, however we adjusted for baseline depressive symptoms and self-rated health, which would partially account for a bias due to negative affectivity (Watson and Clark, 1984). On the other hand, health could also be a mediator of the relationship between work stress and sleep and thus, by adjusting for it, we may have underestimated the size of the association. In conclusion, our findings further underscore the need for research on stress and health to simultaneously consider stressors from different life domains. Even though decision latitude at work is widely recognized as a health-protective factor, previous studies have not considered the effects of decision latitude in a broader life context. The results of the present study show that high decision latitude does not alleviate sleep problems resulting from traumatic life events, but may in fact exacerbate them. Because our data is observational, our results cannot answer the question of whether changing decision latitude of workers who experience traumatic events in private life (e.g. by taking away some of their responsibilities for a limited time window during the crisis) will improve their sleep quality. However, our results suggest that when high decision latitude is already present, increasing it further for workers facing stress in private life may not be beneficial, but rather have the opposite effect. This work was supported by the Danish Working Environment Research Fund under Grant 12-2013-03. Authors have no conflict of interest to declare. Halonen, J. I., Lallukka, T., Pentti, J., Stenholm, S., Rod, N. H., Virtanen, M., Vahtera, J., et al. (2016). Change in Job Strain as A Predictor of Change in Insomnia Symptoms: Analyzing Observational Data as A Non-randomized Pseudo-Trial. Sleep. Karasek, R. A. & Theorell, T. (1990). Healthy Work: Stress, Productivity, and the Reconstruction of Working Life. New York: Basic Books. Lazarus, R. S. (1999). Stress and emotion. A new synthesis. London: Free Association Books. MacDowell, I. & Newell, C. (1996). Measuring health: a guide to rating scales and questionnaires. New York: Oxford University Press.